I cut some hickory from the crotch of a tree about 3 weeks prior to rough turning it. I knew I’d get around to turning it relatively soon, so I just put it in a plastic bag instead of messing with painting or waxing the blank. This blank was very shamefully cut, so it was terribly out of balance while I was roughing the piece in. This platter is destined to live above our china cabinet in the dining room. I promised my wife the first piece off the lathe would be hers. She lucked up and is getting the first two pieces! 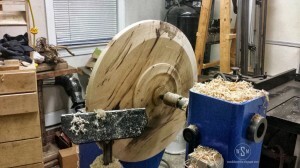 I wanted to do a smaller turning to begin with. I figure just in case something goes wrong a 5 pound piece of wood flying through the shop is less dangerous than a 30 pound piece. 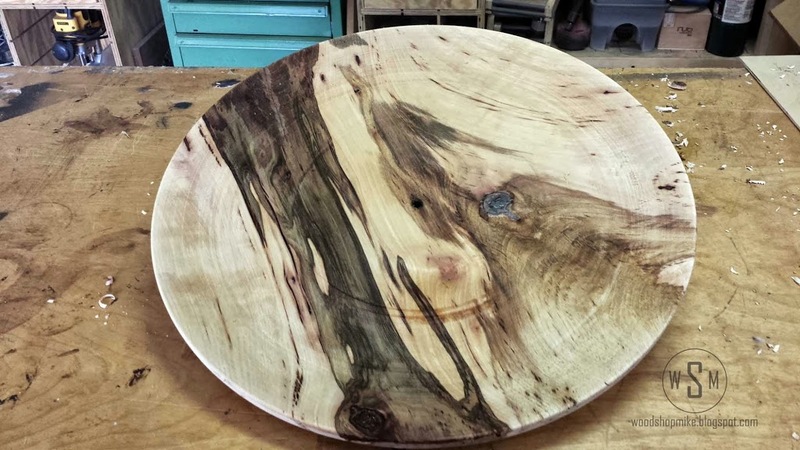 The first two platters are both from the same section of hickory. My wife has affectionately named them lil’ hick and big hick. 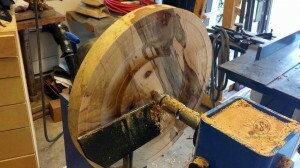 I was concerned about finishing the platter without having the worm screw hole from the screw chuck going through it. On a side note I finally found a spur drive from axminster for the #3 morse taper my headstock has. Hopefully I won’t be making anymore platters with holes in the center. Having not worked with hickory before, I had my concerns that it would be too hard and wear my tools quickly. I’m happy to report that first, this wood is beautiful, and that secondly, my tools have adequately withstood the abuse this piece has offered. For roughing both of the platters, I’ve used my 5/8” P&N bowl gouge almost exclusively. Chainsaws have a vendetta against whatever gets in their way. Be careful and don’t cut your leg off while cutting your blanks! Be sure to wear adequate PPE and use common sense. 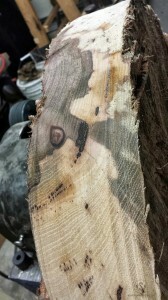 Here’s a tip, don’t cut your logs through the end grain. That will take forever and be tiring. Instead, lay the log on its side and cut along the grain or length of the log. This will make long streaming shavings which can later be used for mulch! How’s that for being green? Using a worm screw in my scroll chuck is my only option for mounting to the lathe at this point. So I drill an appropriately sized hole (not too deep) to accept the worm screw. 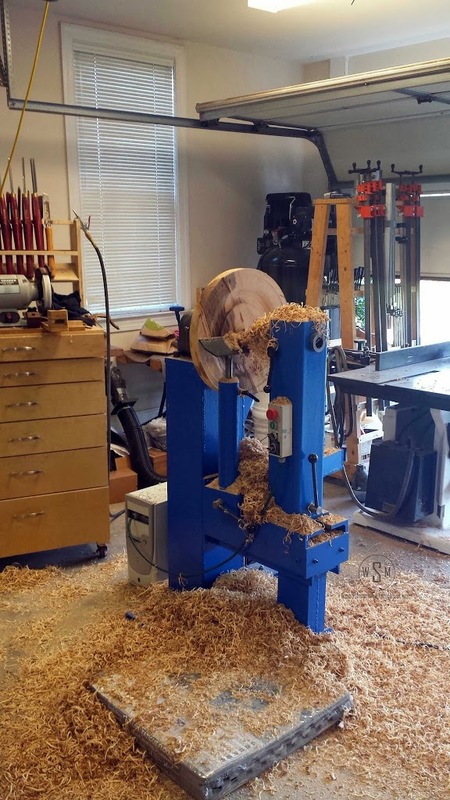 Now this is where a variable speed lathe comes in real handy. I turn on the lathe and slow it way down. Line up the drilled hole in the blank with the slowly spinning worm screw and let the machine do the work. Don’t forget to let go once it gets tight. I like to then put my lathe in back gear and snug the piece on a bit more. 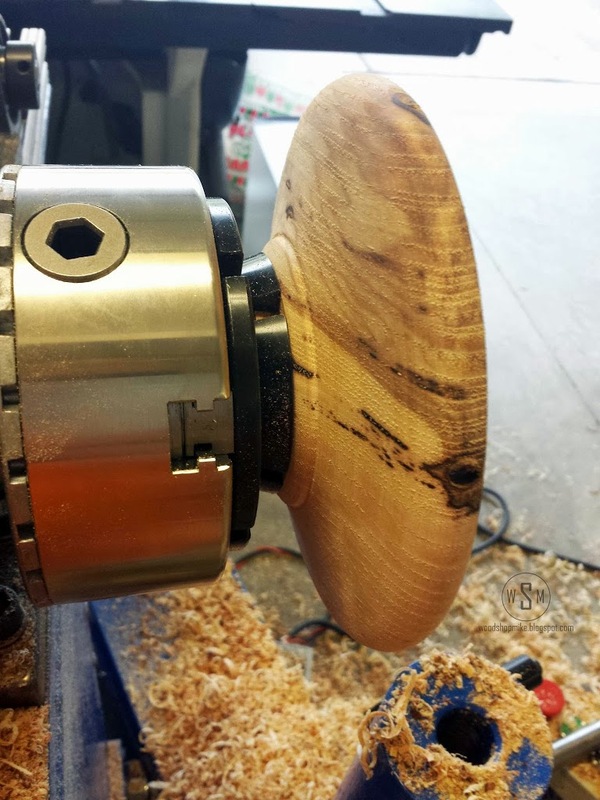 If your lathe doesn’t have back gearing, then hold the hand wheel on the outboard side. Now start roughing in your blank. 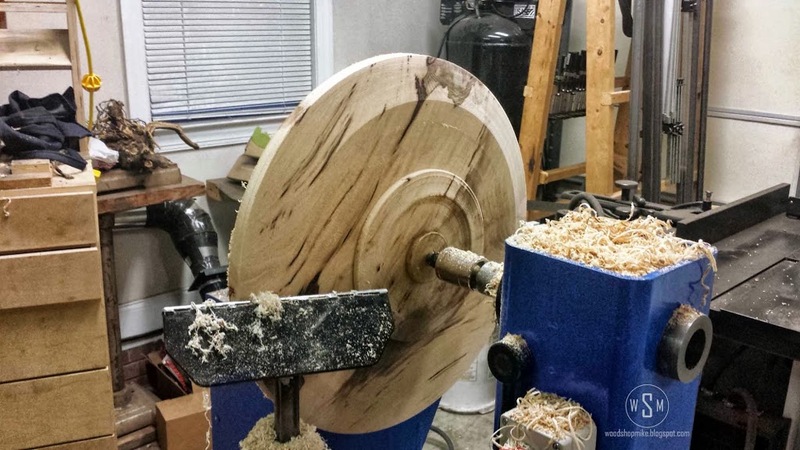 I do this by turning my lathe as fast as it will go without excessive vibration. This is a judgment call, but the long and short of this theory is that the faster the blank is spinning, the less time your tool isn’t in contact with the wood. This in turn gives a smoother, more uniform cut. Once I’ve found an appropriate speed, I begin at the tailstock end of the blank and take short cuts, working my way towards the headstock. Using a side grind bowl gouge, I hold the tool horizontally with the flutes facing the work at 45°. I work on short sections at a time until that portion is round. Repeat this procedure until the blank is round. To check roundness of your blank without constantly turning off the lathe, gently rest the back edge of your gouge on the top of the piece. If your gouge bounces like a baby in a Johnny Jump Up, you still have work to do. Let me first state that since the wood is green (wet) it will move and warp as it dries. There are many approaches to turning green wood, this is just one of them. This first session of turning is not intended to be your final shape; one should “rough turn,” let the piece dry, and then do finish turning. At this point, I turn the tool rest to be perpendicular with the ways. I will now shape the bottom of my piece. 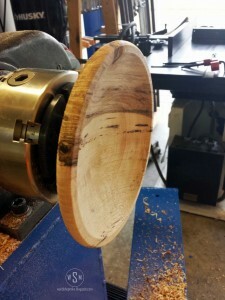 Once I get done with any roughing of this face, I turn a tennon to grab with the scroll chuck and flip the piece around to clean up what will be the front of the platter. Normally I would go ahead and shape the back, but the other side of this blank was so out of balance that I could not run the lathe very fast. I repeat my process and make a recess that the tennon is formed inside of. Now I flip the piece again and shape the back. 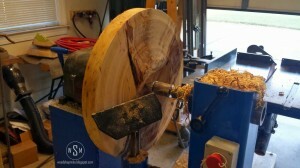 I use a shaping cut with my bowl gouge for this process. This requires the handle of the gouge to be dropped 20°-30° and the flutes to the rolled about 45° in the direction of cut. I proceed to flip my piece once more to grab the tennon on the back of the platter. Now that I’ve created a meaningful shape on the outside of my blank, I am careful to center the piece in the chuck as I evenly press the piece against the jaws. This is required so that your platter will run true as you shape the inside. I turn on the lathe just to verify that my piece is running true. If not, I go back and adjust. I begin roughing out material until the tailstock gets in the way. Leaving support from the tailstock as long as possible just keeps the piece pushed into the chuck a bit more securely. 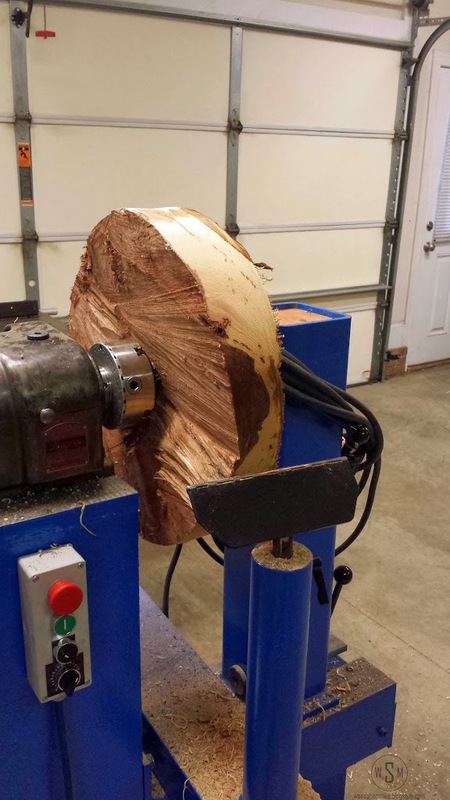 Once this becomes an impediment, I take the tailstock off the lathe. Umph, that thing is heavy. Now I have complete access to the platter. I am still using the roughing cut. 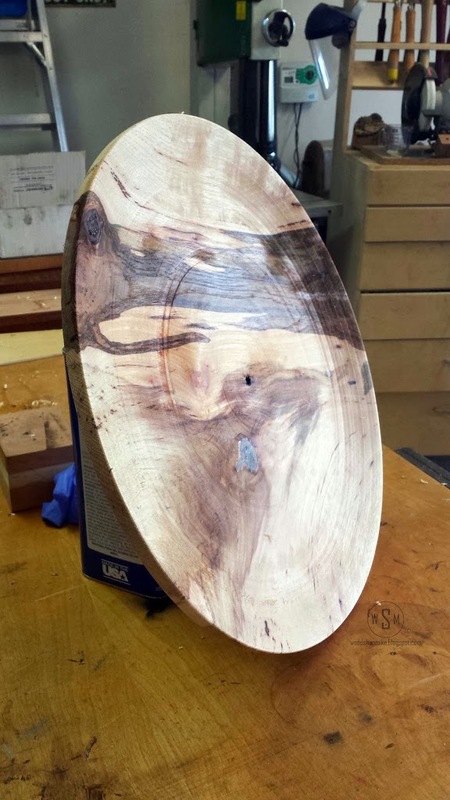 This piece is rather shallow, but the habit to form is to use a roughing cut while working the inside of a bowl or platter. The reasoning is that if you have your gouge elevated on a concave surface, the wings of the gouge will eventually dig in and catch on the piece. This can be frightfully spectacular and ruin your turning or pants. Here’s “lil’ hick” rough turned and ready to dry. Now comes the fun part. Wait for your piece to stop loosing moisture. Once this happens you can finish turn your work. There are many methods to drying green turnings. I currently use a paper bag with a handful of shavings against the bottom of the bowl. Having the shaving on the bottom instead of the inside allows the inside to dry slightly faster than the outside of the piece. Big deal right? It actually is. This makes any cracks that may form be from compression instead of expansion. A compression crack on the inside of a piece will be self-closing, where an expansion crack on the outside will continue to widen as the piece dries. Here’s “big hick” off the lathe. That’s all for now. I’ll have to make a special work holding chuck for these platters while they are drying. 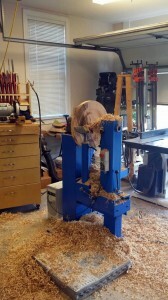 Check back soon for my post on making a Longworth Chuck! I’m so glad you like the post and my blog! Just found this site from 2014 on “BIg Hick” and was wondering if you made a longworth chuck as of yet?